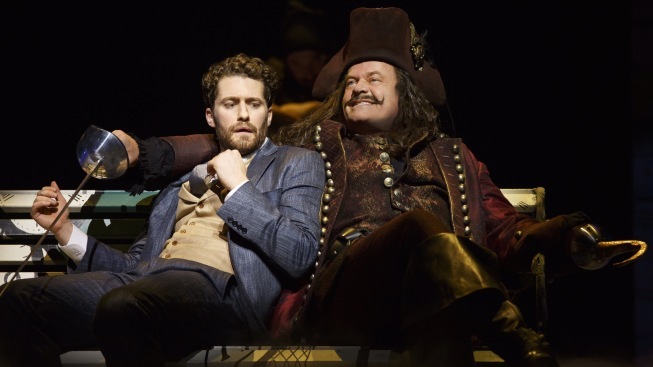 Matthew Morrison and Kelsey Grammer in "Finding Neverland." I’m sorry “Finding Neverland" has finally opened—you can catch it now at the Lunt-Fontanne—because the behind-the-scenes tinkering has made for such riveting headlines: Harvey replaces creative team! Harvey axes leading man! Harvey splits with publicist! Harvey, being Miramax chief Harvey Weinstein, may be a fledgling lead producer, but he is not messing around here: the man’s helped pump millions into “Neverland,” introducing it in England, redoing it in Boston and finally landing it on Broadway … after a side foray to last year’s Tonys, where it was promoted by Jennifer Hudson. The end result is both rousing and erratic, with bits of thrilling stage magic that are signature Diane Paulus (she also directed “Pippin” and “Hair”), and dialogue that sometimes feels as if it’s been focus group-sanitized to within an inch of its life. Billed as the backstory to “Peter Pan,” the musical is based on the 2004 film, with Johnny Depp. Morrison has a consistent Scottish brogue and a melancholy demeanor in a performance that’s very likable. His benefactor, the producer Charles Frohman, is played by Emmy winner Kelsey Grammer, who will do double duty as Captain Hook. Our audience was wildly responsive to Grammer, who is saddled with dialogue such as “I don’t have a child inside me. I have an ulcer.” Everyone around Frohman is chaotic and fey, and the producer sees it as his responsibility to be pragmatic. I’d have been happier with less of his character, and more of Kelly, as the platonic love interest who has the wholesome aura of a Disney princess. The quartet of boys playing the Llewelyn Davies children are exceptional (Aidan Gemme was Peter at the press performance I attended). Carolee Carmello, the three-time Tony nominee, is assertive in her one-dimensional role as Sylvia’s overprotective mother—it’s suggested she’s the inspiration for Tick-Tock, the crocodile. The talented Teal Wicks, as Peter’s grating wife, Mary, doesn’t feel so essential to the proceedings. Barrie’s dog Porthos, last played by a human at the A.R.T. in Cambridge, is now played by an actual dog. We’re frequently given clues as to how Barrie translated events in his real life to elements of “Peter Pan,” and it’s not often that a musical manages such subtlety in one scene and overstatement the next (the composers are U.K. pop star Gary Barlow, of Take That, and Eliot Kennedy; the book is by James Graham). Also … that joke about “fairies” working in the theater? I order you both to walk the plank, Mr. Weinstein and Ms. Paulus. The melodies are pop-song good, if not likely to linger long with you. I most enjoyed “We Own the Night,” in which James and the four boys toy with the pompous participants of a stodgy dinner party, and the first act closer “Stronger,” which soars to a finish indeed so strong it left me trembling. One of the areas in which “Finding Neverland” succeeds is in its balance between technical and non-technical wizardry. Paulus knows when to use her bag of tricks (note Sylvia’s climactic, cyclonic second act farewell), and when to let our imaginations do the work (such as when Peter bounces candlelight off a spoon, foreshadowing the eventual creation of Tinkerbell). “Finding Neverland” is best in its scenes with surrogate father Barrie and the four boys. Those talented kids, who prematurely aged when their own father died, help the writer access his imagination. Alongside Morrison, I think they’re the ones who deserve a lot of the credit for getting “Finding Neverland” to fly. “Finding Neverland,” with an open-ended run at the Lunt-Fontanne Theatre, 205 W. 46th St. Tickets: $72-$147. Call 800-745-3000.